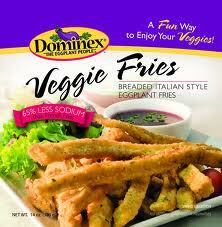 Dominex Veggie Fries – A fresh take on the fry! "Now there is a new, unique and delicious way to enjoy eating vegetables! Our all-new Veggie Fries are a crunchy, flavorful alternative to the traditional French fry or onion ring and are a hearty addition to any meal. With 65% less sodium per serving than the leading brands of French fries and 4g of dietary fiber, all-natural Veggie Fries are a super side-dish boasting nutritional benefits and terrific taste. A batch of Veggie Fries can be baked or fried in less than 15 minutes and make a great side dish, mini-meal or snack for any time of the day. They can also be dipped into zesty sauces for a delicious and filling vegetable treat. Visit Dominex on Facebook or at www.dominexeggplant.com to find more information on these tasty treats"
What we thought: These fries were super tasty! They baked up nice and crispy and were a fantastic alternative to fried french fries. It was nice to change it up a bit and introduce a new side to my family. Of course, it always helps when the new dish is healthy and delicious! We are definitely fans of Veggie Fries and can't wait to try out some of the eggplant based products Dominex makes:) ABCD Diaries gives Dominex Veggie Fries an A+! Buy It: You can find Veggie Fries and other eggplant products at grocers and mass merchandisers nationwide and at Dominex! Disclosure: ABCD Diaries was given a product coupon for review purposes only. We were in no other way compensated. The opinions expressed in this post are ours and ours alone.